From 1 to 2 August, UNU-IAS facilitated an environmental study tour of Ishikawa Prefecture for the Mikage High School (Hyogo Prefecture) Environmental Science Biology Club as a part of the UNU-IAS Director’s Award for winning the Second National Youth Environmental Activity Presentation Contest held in February 2017. The club has been conducting research and outreach activities on the biodiversity of fungi on Mt. Rokko in collaboration with various local actors; and five students participated in this study tour. On the first day, students visited UNU-IAS Operating Unit in Kanazawa (OUIK) and learned about UNU-IAS activities and ecosystem services from Yoshihiko Iida, Research Associate, OUIK. 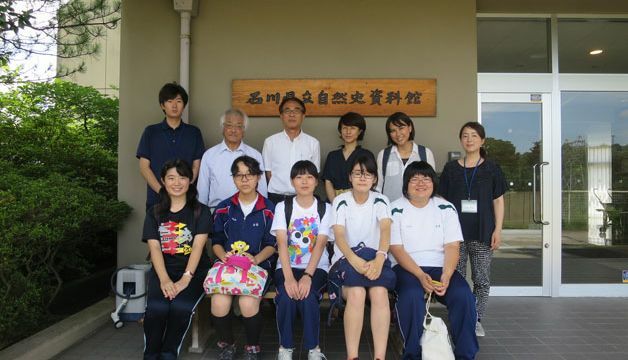 They also observed fungi in Kenrokuen Garden and participated in a fungi seminar at Kanazawa University. On the second day, student visited the Ishikawa Prefectural Natural History Museum and Takigahara Nature School and learned about an initiative utilizing local culture and natural resources.